Formerly known as Peachtree Business Intelligence, Sage Business Intelligence is a reporting tool that lets you make better decisions faster. Need help with custom reports? Find out how you can create your own customized reports. Purchase from CBA and get 1 hour of FREE training on Sage Intelligence Reporting with a CBA Certified Sage Intelligence Consultant. Sage Intelligence (Sage BI) is a comprehensive reporting solution that gives you access to all your business information in one centralized location. Get customizable business reports that are automatically updated with real-time data, so you can access the information you need to make swift, confident decisions. When even greater flexibility and depth are needed to support your business, choose Sage BI. Business Intelligence is an easy-to-use reporting tool that will give you insight into critical financial and operational aspects of your business. Start making data driven decisions for your business now. With Sage Business Intelligence Reporting you get access to all your company's data, and Microsoft® Excel® provides an easy-to-use interface that you're already comfortable with. Unlike other BI software programs, Sage BI is ready use from the start. 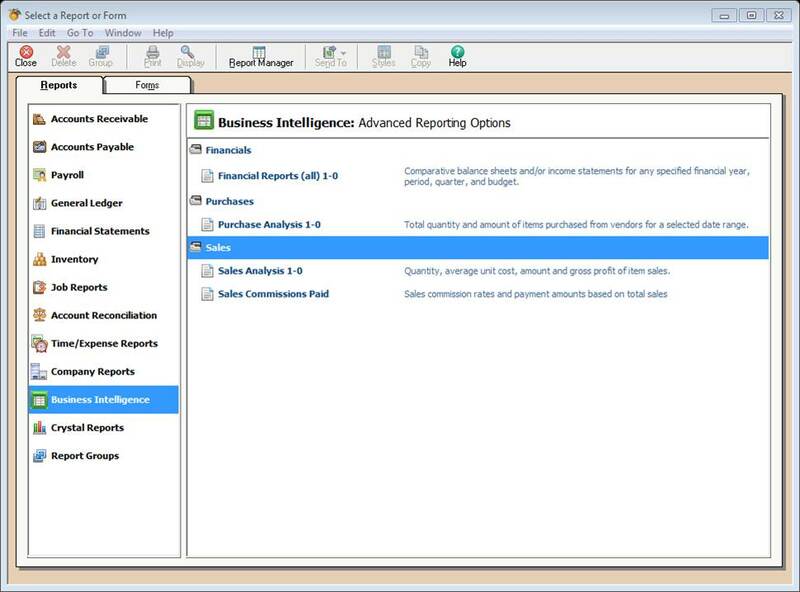 Sage BI tools take the best of both Sage Reports and Excel and combines them into one complete intelligence reporting product. This makes it easier than ever before to access and interpret your company's information. Faster - No more tedious and time-consuming tasks, like manual exporting, compiling, cutting and pasting, or formatting data. Easier - No more complicated broken formulas to fix. No more reformatting the same reports month after month. More Accurate - See critical information on-demand, in real-time, without the need to manually update any spreadsheets. More Details - Drill-down for more detail. Slice and dice to find the answers you want. Make informed, confident decisions. More Visual - Include many different types of graphs and charts to get a better feel for your data, and create live dashboards to get better insight into your business performance. 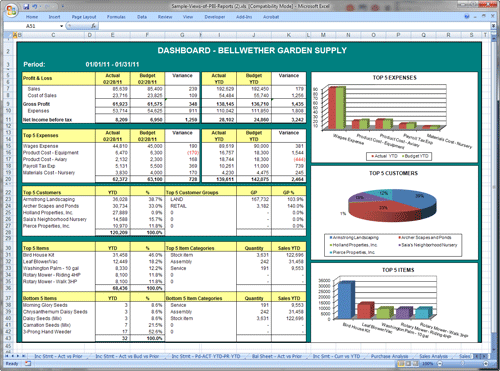 No Install, Use Instantly - Spreadsheet based reporting inside your Sage 50 accounting software. Who doesn't love quick ROI? Sage Intelligence is ready to launch from your Sage 50 accounting software. No separate installation required. Prest-O-Fit manufactures RV parts. They needed a better, faster, and more accurate way to inform sales and purchasing decisions. They teamed up with CBA and used Sage Quantum and Sage 50 Intelligence to streamline the process. The result? A custom automated sales report that takes minutes to compile instead of hours. "The time savings are enormous, and we can now make business decisions more readily." We can custom-design almost any report you need. We'll give you total control over your reporting process. Every customization we make can be saved for future use, saving you valuable time and effort. Get the maximum benefit from your Sage accounting software. 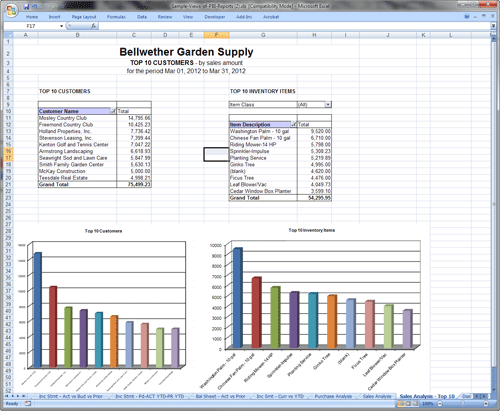 We can customize your reports to your specific business needs and parameters. Help everyone in your company operate more efficiently and effectively with custom business intelligence reports.